Truth be told, I am not the cleaner in our home. Well, I am not the regular cleaner in our home! For the most part my partner does things like the dishes, sweeping, washing the floors and so on. My mother who lives in the basement apartment of our home also comes up and cleans — I have a pretty awesome mom! She will do things like dust, wax and vacuum. As for me, I have an obsession with my bathroom, it is the one room of the house I can’t let anyone else clean because I have to know I have cleaned that room from corner to corner. With all the germs that float around in a bathroom I can’t sleep at night if it hasn’t been cleaned to my satisfaction. With that said, I have teen and a pre-teen daughters, who let’s put it nicely, are a tad messy in the bathroom. I can’t count how many days I go in after they have up and left for school to find toothpaste on my counter (and all in the sink), hair everywhere – did they transform into shedding dogs? and well some days it looks like a war zone with shrapnel everywhere! Thankfully, Lysol® has my back in the battle of the bathroom. They have a full range of bathroom products to disinfect and clean every corner of my bathroom from toilet to tub, sink to shower, counter tops to floors! 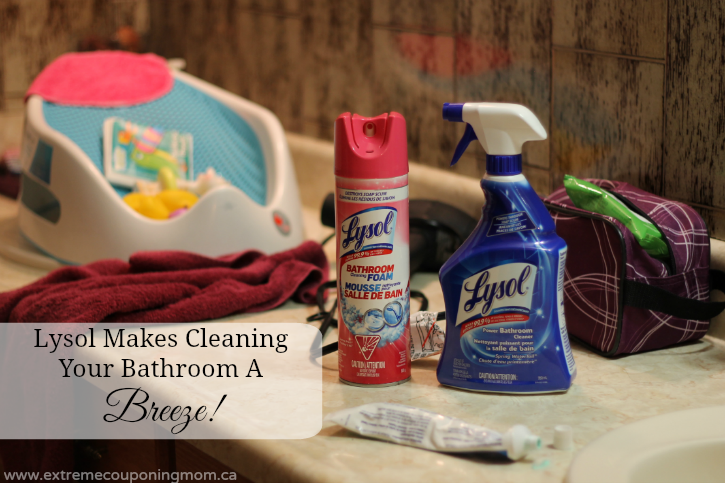 Lysol® Bathroom products also kill 99.9% of germs while blasting away all of those germy bathroom stains that make this bathroom clean obsessed mama cringe. 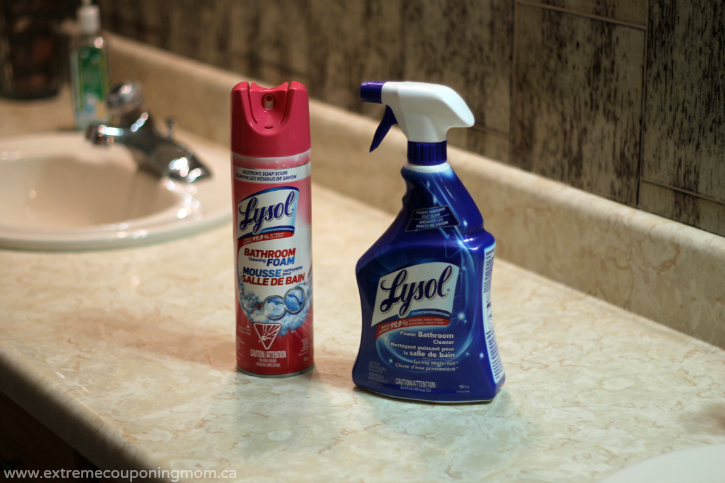 I recently tried out two different Lysol® bathroom cleaning products that I had not previously used, Lysol® Bathroom Cleaning Foam in Summer Fresh scent and Lysol® Power Bathroom Cleaner in Spring Waterfall scent. I was pretty impressed with how easy they were to use, how much faster I got the bathroom cleaned and that the scent wasn’t overpowering. I love that the Lysol® Bathroom Cleaning Foam in Summer Fresh scent sprays nice foam which stays where I spray it. This makes it perfect for cleaning the shower and tub as well as counters, toilets, you name it! I am not sure if you can tell from the photo above, but my bathroom is floor to ceiling tiles, so I like to spray down my tile walls and give them a good wash too because you never know what germy hand has touched what in there. I really like that the scent isn’t overpowering, I am really picky on scents and this one was nice and refreshing! The Lysol® Power Bathroom Cleaner in Spring Waterfall scent is perfect for counters, sinks, tubs and toilets. This product left my sinks shining, it tackled the soap scum and lime scale with ease and very little scrubbing effort from me which really cut down my time spent cleaning. I don’t know about you, but I have much better things to do then spend hours cleaning away all the daily dirt and grime my family leaves behind. The scent of this product was also very nice, light and not overbearing. Even though I already loved cleaning my bathroom, I think I love it a little bit more now that I am not spending forever locked up in there battling the mess! Prevention is key to a clean bathroom and you want to prevent things like mold and mildew from rearing its ugly head in your bathroom. To do so you want to keep a good air flow by using your ventilation fan during and after showers to prevent moisture from building up. Also you want to keep the door and window in your bathroom open when not in use to allow air to circulate. If you already have some mold and mildew issues you want to tackle it head on by using Lysol® Bathroom Cleaning Foam, it will blast it away with little scrubbing as well as kill viruses and bacteria! Creating a cleaning caddy dedicated to supplies needed to clean your bathroom is key in fast and efficient cleaning. Having all the necessary products in one easy to find place will make for much faster cleaning. Fill it with Lysol Bathroom Cleaning Foam, Lysol® Power Bathroom Cleaner, sponges, bristle brushes for those tough messes that need a little extra scrubbing, glass cleaner, paper towels and whatever else you may need. Cleaning your bathroom doesn’t have to be a chore or take half your day. To make cleaning my bathroom easier I find if I clean my bathroom on a Sunday evening after all my family has showered it takes half the time. The heat, steam and water helps loosen tough lime scale and other germy messes. Also daily cleaning will help prevent build up and make cleaning much faster and easier. Disclosure: Although this post has been sponsored by Lysol®, the opinions and language are all my own, and in no way do they reflect Lysol®. Any product claim, statistic, quote or other representation about a product or service should be verified with the manufacturer, company, provider or party in question. I’ve been trying to get the guys here, both Jr and Sr to understand this…..impossible. And the bathroom caddy I put together was to make it easy for them to deal with. I love these tips especially the caddy and daily upkeep. I am not a fan of deep cleaning when it’s really intimidating to be honest. My husband also does the same chores as yours! And my mom helps a lot too. But somehow we still have struggles with keeping our home as clean as we would like. I’m totally going to take your advice about the caddy so it’s easier to just grab the whole thing in one container and it keeps my cabinet under the sink organized too. Win win! 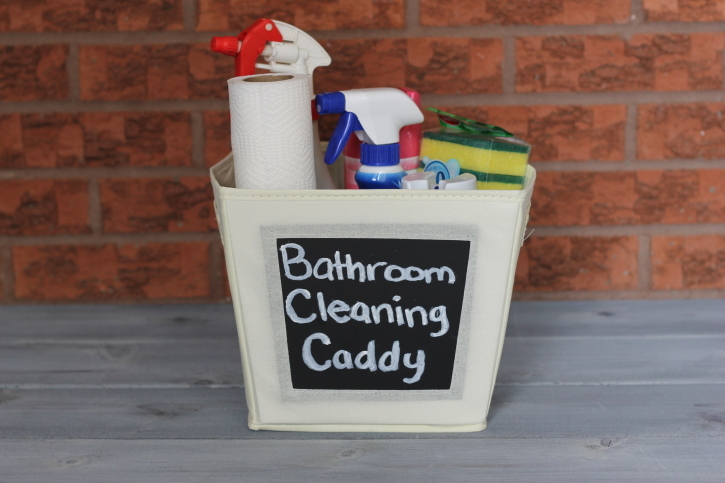 I love that idea to get a bathroom caddy to have everything organized! I love your tip of cleaning right after the shower has been used, I’m sure it would save some time. I’m going to try it this weekend! Big fan of Lysol wipes too! I am one of those people who actually LIKES cleaning the bathroom, we are few and far between. I used to clean my friend’s bathrooms for them…. I was a weird child. Anyways I love the idea of a bathroom caddy. Haven’t tried the cleaning foam yet……but I’m curious! I always worry about chemical residue when using cleaners like this. The thought of residue scares me more than the dirt does. Lysol has amazing cleaner products and I’ve used all of them. The deodorizing spray smells great and kills germs.